Mini Tugboat Plans and Houseboat Plans Can Be Ordered Here! Please be certain when you order that your name and address are input into your order. If not, please send a separate email to berkeleyengineering@yahoo.com and inform us of your information. ♦♦PLEASE NOTE THAT THESE PRICES ARE FOR SHIPPING INSIDE THE UNITED STATES. WHEN OUTSIDE OF THE U.S. AND PLACING AN ORDER FOR AN INFORMATION PACKET OR PLANS, PLEASE ALSO GO TO THE BOTTOM OF THIS PAGE, WHERE PRINTED IN RED YOU WILL FIND ADDITIONAL SHIPPING COSTS FOR OUTSIDE OF THE U.S. CLICK ON THE APPROPRIATE "ADD TO CART" BUTTON. THANK YOU VERY MUCH. (NOTE:YOU WILL BE CLICKING ON 2 "ADD TO CART" BUTTONS INSTEAD OF JUST ONE. )THANK YOU VERY MUCH! Information Packet and Study Plans for Mini Tugboats -$6.00 U.S.
Information Packet and Study Plans for Houseboats -$6.00 U.S. 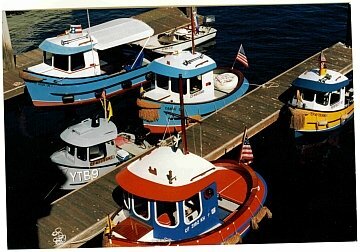 Complete Plans for Micro Tug 9 (9' Mini Tugboat) -$70.00 U.S. Complete Plans for Perfect 10 (10' Mini Tugboat) -$80.00 U.S. Complete Plans for Candu Jr. (11' Mini Tugboat) -$90.00 U.S. Complete Plans for Candu E-Z (14' Mini Tugboat) -$110.00 U.S. Complete Plans for Aqua Casa 16 (16' Houseboat) -$120.00 U.S. Complete Plans for Aqua Casa 20 (20' Houseboat) -$130.00 U.S. Complete Plans for Cape Codder (20' and 24' Houseboat, both sets included) -$225.00 U.S.